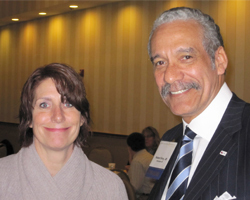 Ellen Lawton, executive director of the National Center for Medical-Legal Partnership, with Robert Grey. Robert J. Grey Jr., an incoming member of the LSC Board of Directors, and LSC President Victor M. Fortuno participated in a panel discussion on medical-legal partnerships at a March 26 summit in Arlington, Va., sponsored by the National Center for Medical-Legal Partnership. Grey, a partner in the law firm Hunton & Williams LLP, discussed the importance of pro bono work in helping ensure that low-income Americans have access to justice. Lawyers, he said, "are a safety net for people," providing them with a level playing field in the judicial system. He noted that his firm operates neighborhood-based pro bono offices in two Virginia cities, Richmond and Charlottesville, and in Atlanta. LSC President Fortuno reaffirmed the Corporation's support for medical-legal partnerships, saying that "these partnerships make meaningful differences in the lives of low-income Americans across the nation." Thirty-nine LSC-funded programs participate in 43 medical-legal partnerships in 27 states and focus on children, families, the elderly and the disabled. Alan W. Houseman, executive director of the Center for Law and Social Policy and former senior staff member at LSC (1976 to 1981), and Gerry Singsen, a consultant and former LSC vice president (1979 to 1982), joined Grey and Fortuno on the panel. Hannah Lieberman, a consultant and former deputy executive director of the Legal Aid Bureau in Maryland, moderated the discussion. 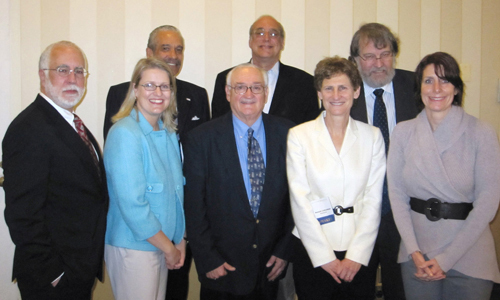 Left to right: Victor M. Fortuno; Megan Sandel, National Medical Director, National Center for Medical-Legal Partnership (NCMLP); Robert Grey; Alan Houseman; Barry Zuckerman, Founding Director, NCMLP; Hannah Lieberman; Gerry Singsen and Ellen Lawton. The panel was part of the 2010 Medical-Legal Partnership Summit that brought health professionals, social workers and lawyers together for a three-day program, which was titled "Medical-Legal Partnership: Patients to Policy." Ellen Lawton is the executive director of the National Center for Medical-Legal Partnership. To learn more about the Center, click here. The Los Angeles Times and the New York Times recently published articles highlighting medical-legal partnerships in the Los Angeles area and in Cincinnati. The Los Angeles Times article profiles the partnership between Neighborhood Legal Services of Los Angeles County and a local health center. Dennis Hsieh, an Equal Justice Works Fellow at the legal aid program, spends two days a week at the center working to solve the legal problems that contribute to the patients' poor health. Since August 2008, Hsieh has opened 513 cases and helped 866 clients. "People never have just one problem," he said. "They lead complex lives." The New York Times article focuses on the partnership between the Legal Aid Society of Greater Cincinnati and the Cincinnati Children's Hospital. Elaine Fink, a lawyer with the legal aid group who helped found the partnership, notes that training doctors to spot legal issues is a key element to the partnerships. "What can a doctor feel comfortable asking in a few seconds that will identify a legal issue," she said. "It's quite different from an attorney questioning a client." LSC-funded legal aid programs are participants in more than half of all medical-legal partnerships in the country, according to the National Center for Medical-Legal Partnership. Learn more here. The website of the Legal Services Corporation was featured in a segment on NBC's Today Show on March 24. The segment was part of the show's "Money 911" series and featured a panel of financial advisors who answered questions from viewers on topics including understanding credit reports, coping with medical expenses and balancing debt loads and savings accounts. One panelist, David Bach, fielded a question from a young, low-income Colorado couple who could not afford the monthly payments on the $15,000 in hospital debt they incurred for the births of their three children. Bach told the couple to explain their financial situation to the hospital and work with them to establish a reasonable payment plan. "If they won't work with you," said Bach, "go get a legal advocate. There are legal services around the country that will work with you." 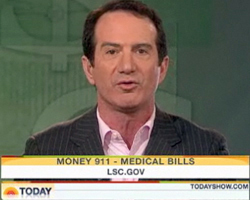 He then referred viewers to LSC's website and urged them to contact legal advocates in their area. Statistics gathered by LSC staff show that the Corporation's website had 3,000 more visitors that day than it did on the same day a week prior. On March 11, Wyoming Governor Dave Freudenthal signed into law a bill that for the first time in Wyoming's history will dedicate state funding for civil legal aid to the poor. The law, which becomes effective on July 1, creates a $10 fee that will be attached to certain cases filed in the state's courts. The new fee is expected to generate $1 million to $1.5 million a year, according to an article in the Casper Journal. "Our Constitutional forefathers saw fit to ensure that the courts belonged to the people," said Gov. Freudenthal in a letter of support ( 94k) for the bill. "Unfortunately our current legal system falls far short of that bedrock principle. Conservative estimates put our extremely low-income population in Wyoming at about 75,000; national figures tell us that at least 80% of the people in that group who have a civil legal issue are not able to get any help. That's simply unacceptable." The Wyoming Supreme Court will be responsible for using the funding to deliver statewide civil legal services, and the goal is to have the program established by July 2011, according to the state legislature's summary of the bill. Currently, the LSC-funded Legal Aid of Wyoming is one of only a few providers of civil legal aid in the state, according to the state's Access to Justice Commission. Other providers include the state's domestic violence coalition and programs run by the University of Wyoming. Legal Aid of Wyoming receives about $700,000 from LSC and is responsible for providing services throughout the entire state. Legal Services NYC is among the legal groups that will participate in New York City's new city-wide foreclosure prevention program announced by Mayor Michael R. Bloomberg on March 29. The new program, NYC Service Legal Outreach, seeks to train 300 volunteer attorneys to provide legal assistance to homeowners facing foreclosure during the state's mandatory settlement conference stage, where homeowners meet with banks to negotiate foreclosure alternatives. Legal Services NYC and three other legal groups will provide the training and supervise the work of the volunteers. The attorneys will also have access to foreclosure resources via a website supported by Pro Bono Net. "The City's legal community has a long, proud history of pro bono work, and we are tapping into that tradition to bolster our comprehensive effort to prevent foreclosures," said Mayor Bloomberg in the announcement. The announcement notes that the city had nearly 21,000 foreclosures in 2009, up from about 14,000 in 2007 and 2008. Legal Services NYC provides legal assistance to low-income residents through a city-wide network of legal aid offices and outreach centers. The Board of Directors of Legal Services NYC announced [on March 22] that Andrew Scherer, Executive Director and President of Legal Services NYC for the past nine years, has decided to resign, effective upon selection of an Interim Director by the Board. Mr. Scherer said that he is leaving his post to pursue other interests. Under his leadership, the organization has gained a sound financial footing, a stable infrastructure and an enhanced capacity to provide high quality legal services to low-income New Yorkers, and is now well positioned to take on future challenges. "Working at Legal Services NYC has been challenging, exciting and highly rewarding. Throughout my tenure, I've been honored to work with people who have extraordinary talent and the deepest commitment to access to justice. The mission of Legal Services NYC – to provide the most effective civil legal representation to New York's low income communities – could not be more important," said Mr. Scherer. He continued, "I am enormously proud of what we have accomplished during my tenure as Executive Director and will always be proud of my long association with Legal Services NYC. I'm taking this action, after lengthy consideration, because I think it's a good time for the organization and for me to pursue new directions." The LSC-funded Georgia Legal Services Program was highlighted in an April 1 Atlanta Journal-Constitution article about the shortage of lawyers in rural Georgia. The article, "Lawyers a luxury in rural Georgia," by Pralte C. Paul, notes that only about 30 percent of the state's actively practicing lawyers operate in the 154 counties that lie outside of the metro Atlanta region. Thirty-five of those counties have fewer than four lawyers and some have no lawyers at all. The seventy field attorneys working for the Georgia Legal Services Program, who are responsible for serving low-income residents in all but five of the state's counties, are among those working to meet the need for legal help. And like many legal aid programs across the country, they are watching the need increase while their resources decrease. "It's going up dramatically," said Mike Tafelski, a lawyer in the program's Macon office, referring to his caseload. "When you're in the office, the phone does not stop ringing." Phyllis Holmen, the program's executive director, notes that funding from the state's Interest on Lawyers' Trust Account program has been cut in half, with more cuts likely for the future. Last month, handfuls of law students across the country chose to spend their spring breaks providing legal services to the poor instead of unwinding on the beach or cruising the ski slopes. In California, students and attorneys from Southwestern Law School in Los Angeles took to the road in the "Justice Bus," traveling throughout the state to deliver legal services to poor residents and gain some real-world experience in the process. The bus, which was organized by the Public Interest Clearinghouse, stopped in Paso Robles in late March to offer help with financial and housing issues. "These students are wonderful," said Michael Blank of California Rural Legal Assistance, "they've given up their Spring Break to come 200 miles to work with low-income people." In South Dakota, law students from the University of South Dakota spent their spring breaks traveling to the state's American Indian reservations preparing wills for residents. The project is a collaboration among Dakota Plains Legal Services, Equal Justice Works/AmeriCorps and the law school. Students opened a total of 71 will preparation cases. In North Carolina, law students from the University of North Carolina traveled throughout the eastern part of the state to prepare wills and power-of-attorney documents. Coincidentally, one of the students met a woman who years ago had worked with the student's grandfather, someone she had never met. The project was coordinated by Legal Aid of North Carolina, the law school and another organization. Download LSC's report on law school partnerships ( 178k) for examples showing how legal aid programs and law schools around the country work together to increase access to justice. Florida's Bay Area Legal Services has been named one of the top workplaces in the Tampa Bay area for 2010 by the St. Petersburg Times. The list includes 60 area employers separated into categories by size. Bay Area Legal Services is ranked fourth out of 30 employers in the "Small" category, which includes workplaces with 50 to 149 locally based employees. The rankings were based on responses to surveys circulated to employees throughout the region. In other words, notes the St. Petersburg Times, "The Times didn't choose the companies; the employees of the companies did." Eighty of the legal aid group's more than 100 employees completed the survey, praising the organization for its great management, flexible work schedules, dedication to its mission and caring and congenial staff. The American Bar Association Business Law Section will present its 2010 National Public Service Award for an individual to Douglas L. Rogers, volunteer lawyer with the Ohio State Legal Services Association, on Friday, April 23, during the section's Spring Meeting in Denver. Through the award, the ABA Section of Business Law annually recognizes the work of an individual lawyer who has demonstrated a commitment to delivering pro bono legal services in a business context. Rogers received his nomination for his contributions to the Ohio Poverty Law Center and Southeastern Ohio Legal Services as well as to OSLSA. As a full-time volunteer since 2008, Rogers has worked with distressed Ohio homeowners, particularly the elderly and disabled, in need of foreclosure defense assistance. He also assists low-income clients with consumer matters. His understanding of complex business transactions such as securitizations has proved invaluable as he provides foreclosure defense assistance to clients not able to represent themselves adequately. He has also helped prepare other SEOLS lawyers for foreclosure defense work. The Management Information Exchange is hosting upcoming training sessions for legal aid supervisors and new executive directors. On April 26-28, MIE will host "Advance Beyond the Basics: Supervising for Excellence," in Atlanta, Ga. Topics to be covered include creating effective teams, leading for change and professional development tools for supervisors. The training session is recommended for immediate supervisors of legal work, including managing and supervising attorneys, litigation directors and executive directors. Click here for more information. On May 11-12, immediately preceding the ABA/NLADA Equal Justice Conference, MIE will host a training session for new executive directors in Phoenix, Ariz. The training session seeks to help new directors gain deeper insight into their work. Topics to be covered include differentiating between leadership and management, determining impact of a program's work and working effectively with a board of directors. Click here for more information. Note: The following article was submitted to the Cleveland Plain Dealer by Megan Sprecher, a staff attorney in the Legal Aid Society of Cleveland's Community Advocacy Program, and Michael McGrath, Chief of Police for the city of Cleveland. Last year, because of cooperative work between the Legal Aid Society of Cleveland and the Cleveland Police Department, "Rosa Gomez" [not the client's real name] was able to free herself and her young child from an abusive relationship.